This poster is filled with imagery emphasising the impact of the industrial revolution on the textile industry and, subsequently, the lives of women. Two photographs are reproduced. One shows a group of women working in a 1930s 'sweatshop' and another shows an isolated 'outworker' hunched over her sewing machine in her Melbourne home, surrounded by garments to be stitched. 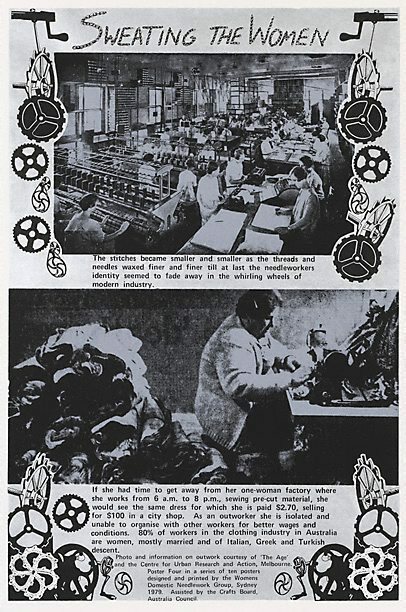 The cogs and wheels of manufacturing engulf them, symbolising the loss of control women have sustained in the production and use of textiles, due to industrialisation and mechanisation. The aim of the Women's Domestic Needlework Group was to highlight the devaluation of the complex skills and knowledge handed down through generations of women, only to be replaced by mass-produced goods made by unskilled labourers.